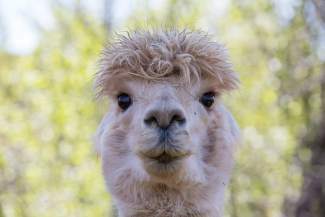 Over-the-line, a fashion forward alpaca at Big Hat Ranch, stands for a portrait shortly after snacking on some clovers in Mccoy on May 20. 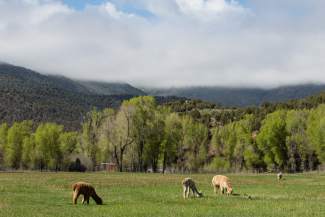 Alpacas graze on open pasture at Big Hat Ranch in Mccoy on May 20. 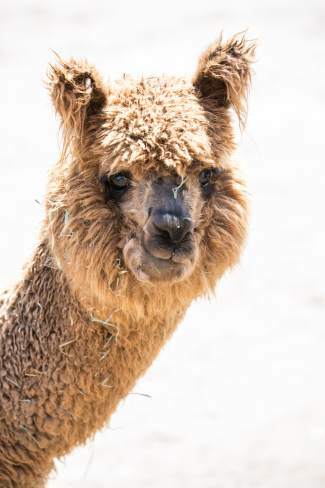 Pie, a curious and friendly alpaca at Big Hat Ranch in Mccoy, prepares to say hello on May 20. 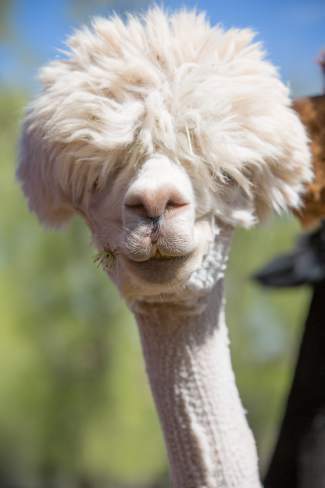 Stivinix, an Alpaca at Big Hat Ranch, sports a rock star hairdo in Mccoy on May 20. 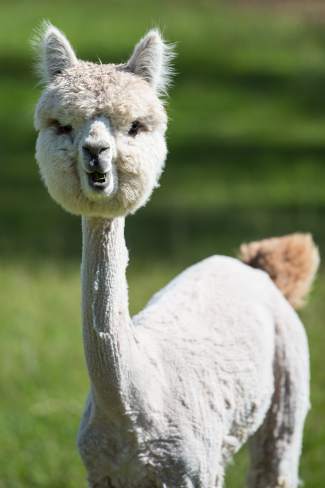 A freshly shorn alpaca looks inquisitively at visitors to Big Hat Ranch in McCoy. 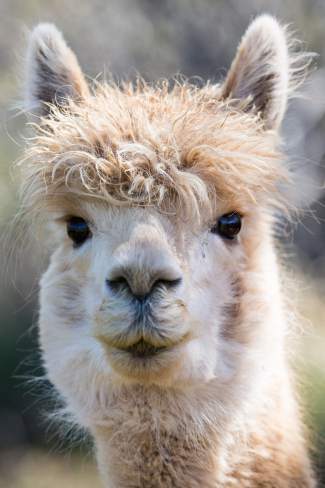 Big Hat Ranch specializes in the raising of alpacas for their unparalleled quality fleece. While most commonly associated with the high Andes regions of South America, the oldest alpaca remains actually exist in fossil beds found in Nebraska. 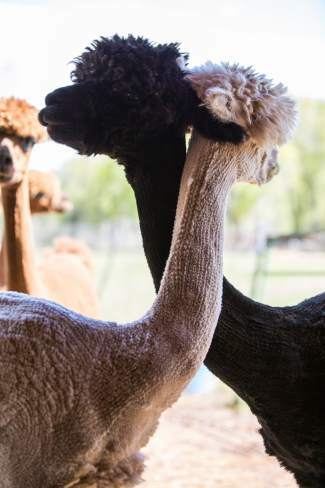 Over-the-line and Miss Moonlit, alpacas at Big Hat Ranch, embrace on a warm May day in Mccoy. Three alpacas gather courage in numbers to investigate a foreigner to Big Hat Ranch in McCoy. Alpacas are incredibly social creatures and live harmoniously in large groups. 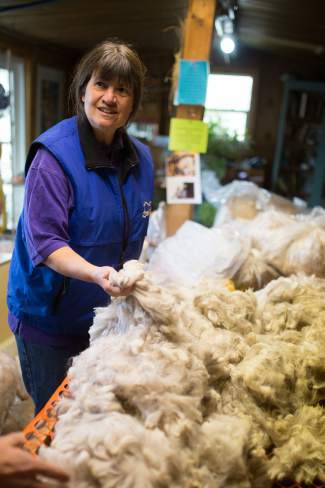 Cass Galloway, co-owner of Big Hat Ranch, shows off an award-winning alpaca fleece in their storage barn in McCoy. The fleece is evaluated using measures such as density, fineness, luster, crimp, color and lock structure. 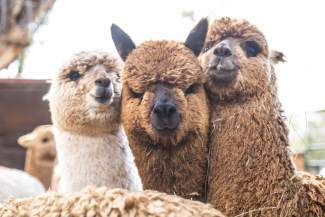 Three alpacas, Poet, left, Moon Unit Zappa, middle, and Delta Brown, right, gather courage in numbers to investigate a foreigner to Big Hat Ranch in Mccoy on May 20. Alpacas are incredibly social creatures and live harmoniously in large groups. Katieâs Mi Duena, a resident alpaca of Big Hat Ranch, basks in the sunshine of a warm May day in Mccoy. 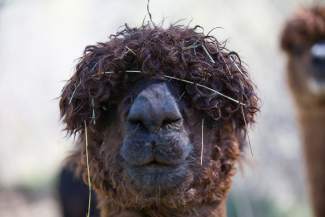 Tiara, an alpaca at Big Hat Ranch in Mccoy, stares out from behind her bangs at strangers to the Ranch on May 20. 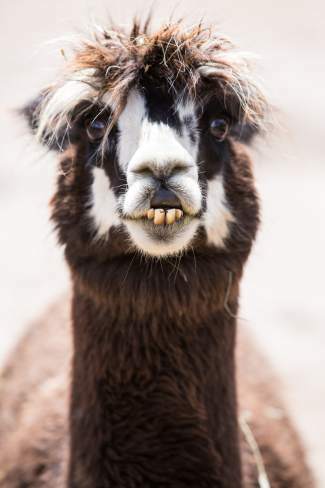 A la Modeâs Peruvian Pie, an alpaca at Big Hat Ranch, could care less about a little grass stain in her beard when new faces appear in the pasture on May 20 in Mccoy. Big Hatâs Soliloquy, a freshly shorn alpaca, looks inquisitively at the new visitors to Big Hat Ranch in Mccoy on May 20. 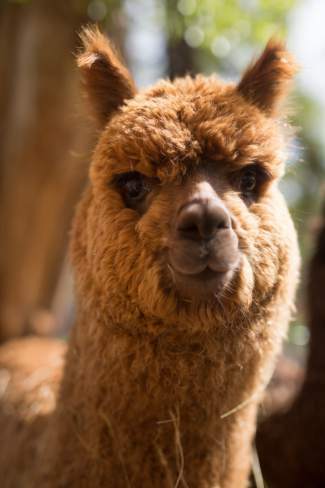 Big Hat Ranch specializes in the raising of alpacas for their unparalleled quality fleece. While most commonly associated with the high Andes regions of South America, the oldest alpaca remains actually exist in fossil beds found in Nebraska. 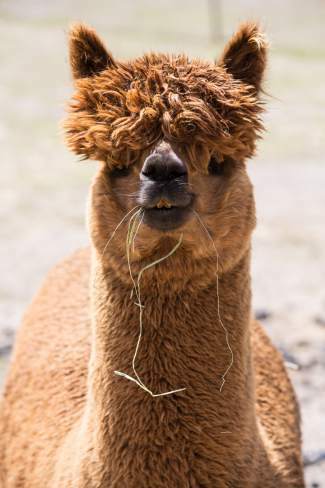 Apres Vous, an alpaca at Big Hat Ranch, isn't concerned with the appearance of a few stray pieces of dangling hay on a beautiful May day in Mccoy. An alpaca at Big Hat Ranch,Painted Sky Rapscallion, stops a busy frollicking, sleeping, and eating schedule to study the newcomers in Mccoy on May 20. 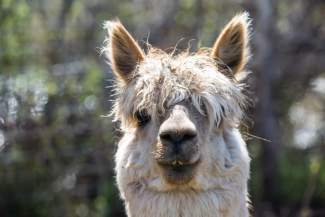 Bittersweet, an alpaca at Big Hat Ranch, shows off her permanent smile in Mccoy on May 20. Big Hat Ranch alpaca, Painted Sky Mimosa, chews a mouthful of grass while staring off into the mountains in Mccoy on May 20. Duena, and alpaca at Big Hat Ranch, poses for her portrait in Mccoy on May 20. 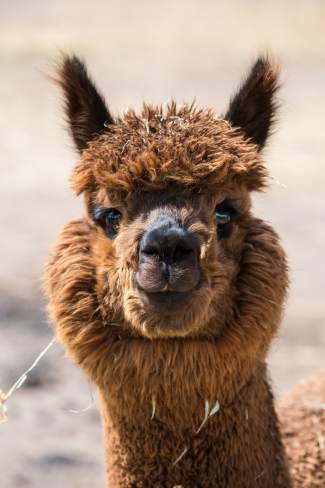 An alpaca named Rhiannon, who happens to be Stivinix's mom, is under the impression that an inability to see is equal to not being seen at Big Hat Ranch in Mccoy on May 20. 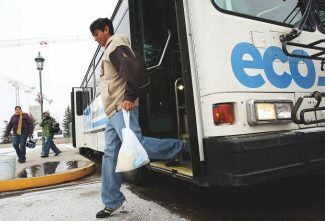 Up to 100 people will be able to travel to three Eagle County ranches by bus, where ranching families and managers will be able to tell their story and discuss and show members of the public the some of the operations of their ranch. Seating is limited. Contact the Eagle Valley Land Trust, 970-748-7654, or go to www.evlt.org. 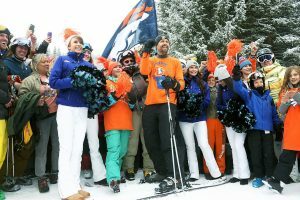 EAGLE COUNTY — You may not know R.B. 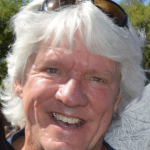 and Cass Galloway, but you probably know Old Dog and Cass. They’ve been around a long time, and these days they run the Big Hat Ranch in McCoy. They own and operate the ranch, but not as in “big hat, no cattle.” They never raised cattle. Now they raise alpacas. They used to raise elk, which explains the 8-foot fences and also why Cass can climb over an 8-foot fence. You think llamas are cranky? Try elk. “I got really good at climbing those 8-foot fences in a big hurry,” Cass said. The alpaca (Vicugna pacos) is a domesticated species of the South American camelid. While they’re centered in the high Andes, these days, the oldest alpaca remains are from fossil beds in Nebraska and are on display in the Smithsonian. 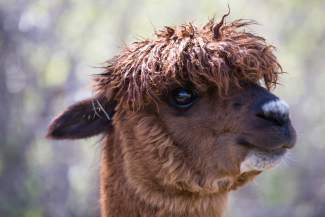 Like most members of their family, alpacas spit, but mostly at other alpacas. “They will spit at you if you deserve it,” Cass said. They also hum when they’re feeling good about life, which is most of the time because life is pretty good if you’re an alpaca. Since they’re pretty even tempered, alpacas tend to hum much more than spit. They’re smaller than llamas, and while you can get an alpaca pack, they’re not generally beasts of burden. Also, llamas are hairy and cranky. Alpacas are raised for their fiber — not their meat. That fiber is used for making knitted and woven items, like you might make with wool, only softer. Cass and Old Dog run a true farm-to-market operation. Their alpaca fiber is woven into all kinds of things and then sold in their store in Eagle. The socks are like walking on angels’ wings. They even bag up the alpaca poo and sell it as fertilizer, and it’s great. Alpacas are such herd animals that they even poo in communal piles, which makes it easier to step around, instead of in. 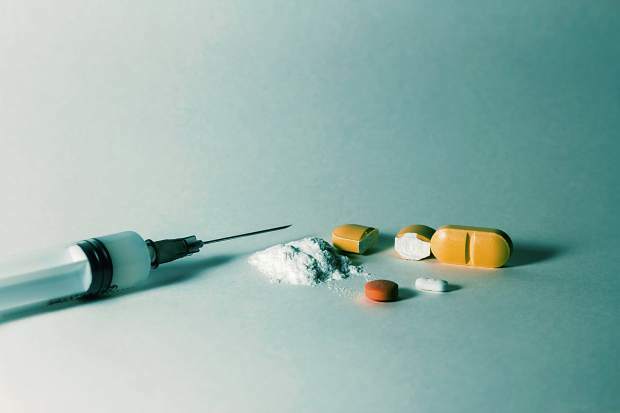 It also helps eliminate parasites that could kill the average alpaca. Rock Creek runs through their ranch. It starts in the mountains above the ranch and if you watch the storms gather you can tell when Rock Creek will start rocking. Alpacas are pretty bright and very curious, Cass said. Not only are the alpacas pretty darned adorable, they all have names. Stevie Nicks is Poets and Landslide’s mama. Moon Unit Zappa is going her own way. So is Fleetwood Max. 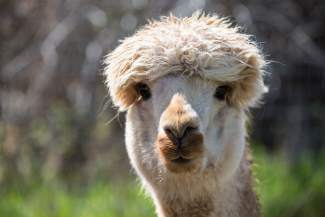 Alpacas are sheared once a year — about this time of year — because once a year is enough. 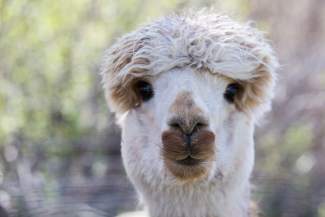 You might see some inane hate piece from PETA, decrying alpaca shearing. Cass has been entering her alpaca fiber in shows since 2004, successfully competing against farms with 2,000 animals. They have a couple hundred, on their big days. Because people don’t seem to know where food and clothing begin, Cass and Old Dog give ranch tours. School children are regulars. So are senior groups. They spend half the days with the alpacas, and the other half in fossil beds looking for prehistoric treasures. Alpaca farming is an agri-business, and it has to be treated as one. Cass said. She loves her alpacas, but sometimes you have to refresh your stock. “People don’t want to cull their herds, and it becomes a problem as they age,” she said. You can run four or five alpacas an acre. 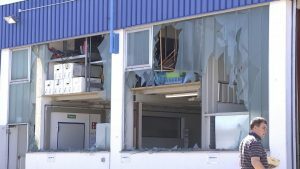 It doesn’t cost much to break into the business, but can be pricey to stay in it. You can pick up a male gelding for about $50. Males can weigh about 180 pounds. However, a breeding female will set you back between $5,000 and $25,000. When Cass and Old Dog bought the Flogus ranch 20 years ago, they had to interview. “They were such great stewards of this land,” Cass said. Cass and Old Dog had the money, but the Flogus family wanted to be sure they had the right attitude. They even had to interview with the neighbors. Not long after they bought the ranch, they also bought the McCoy school, upgrading the building and turning it into a community center. Cass and Old Dog also own a historic hotel in Minturn and the Red Cliff Community Church.